The Speech Recognition feature in Windows 7 allows you to input data into a document using speech rather than a keyboard or a mouse. 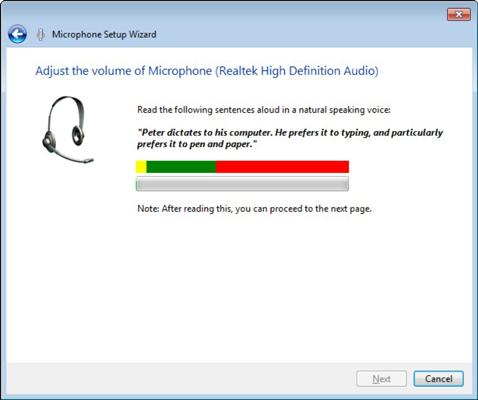 The Speech Recognition feature has been around for a while now, but Microsoft has improved its functionality in Windows 7. 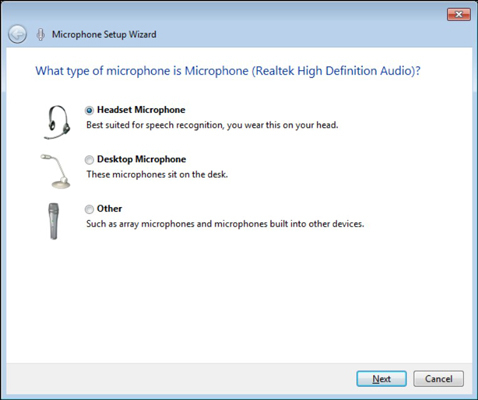 Attach a desktop microphone or headset to your computer and choose Start→Control Panel→Ease of Access→Start Speech Recognition. The Welcome to Speech Recognition message appears. If you’ve used Speech Recognition before, this message won’t appear. Select the type of microphone that you’re using and then click Next. The next screen tells you how to place and use the microphone for optimum results. Read the sample sentence aloud. When you’re done, click Next and click Next again. Establish your microphone connection by reading a sentence aloud. Choose whether to enable or disable document view. Click Next. 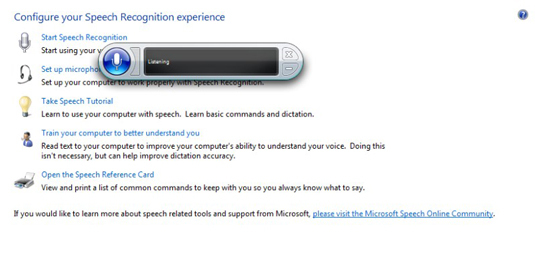 If you choose Enable, Windows will read through your documents and e-mails to learn your speech patterns. Choose whether you want to turn on Speech Recognition manually or by voice. Click Next. Manual activation requires you to use a mouse, pen, or keyboard to turn the feature on. If you want to see the voice commands, click the View Reference Sheet button and read about or print the reference information; click the Close button to close that window. It’s a good idea to do this because speech commands aren’t always second nature! By default, Run Speech Recognition at Startup will be selected. If you want to disable this feature, deselect this option. Click Next. The final dialog box informs you that you can now control the computer by voice. (Optional) Click Start Tutorial to help you practice voice commands. Click Close when you’re finished. You can always go back to the tutorial later by clicking the Take Speech Tutorials link in the Speech Recognition Options window accessed from the Ease of Access window of the Control Panel. Say “Start listening.” Or click the Start Speech Recognition link if you chose manual activation. You can now begin using spoken commands to work with your computer. To stop Speech Recognition, click the Close button on the Speech Recognition Control Panel (or say “Stop Listening” to deactivate it without closing it). To start the Speech Recognition feature again, choose Start→Control Panel→Ease of Access→Speech Recognition and then click the Start Speech Recognition link.